After the invasion of Poland in 1939 the Germans established ghettos in several Polish cities, where Jews were effectively imprisoned. This is how the Holocaust started. Living conditions in the cramped ghettos was appalling, and disease, hunger and overcrowding killed tens of thousands. The Germans deported Jews from all over occupied Europe to these ghettos, modeled after the ghettos the Catholic Church had established all over Europe since the Middle Ages. In response to Hitler's plans to invade Poland, Heydrich re-formed the Einsatzgruppen to travel in the wake of the German armies. Heydrich gave the Einsatzgruppen commanders carte blanche to kill anyone belonging to groups that the Germans considered hostile. 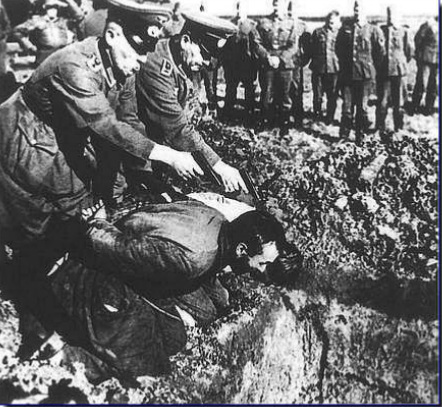 After the occupation of Poland in 1939, the Einsatzgruppen killed Poles belonging to the upper class and intelligentsia, such as priests and teachers. The mission of the Einsatzgruppen was therefore the forceful depoliticization of the Polish people and the elimination of the groups most clearly identified with the Polish national identity. As stated by Hitler in his Armenian quote, units were sent: "...with orders for them to send to death mercilessly and without compassion, men, women, and children of Polish race and language. Only in this way can we obtain the living space we need. Whatever we find in the shape of an upper class in Poland will be liquidated," Hitler had declared. The massacres committed in Poland in 1939 caused tension with the German Army, who, while having no moral objections to the massacres of Poles, felt these killings were injurious to military discipline.